Park Hyatt Toronto Yorkville is a luxury hotel in downtown Toronto, Canada with a contemporary design. This review features photos of the guest rooms, common areas, the view from the hotel, some notes about the location, and our thoughts on whether the Park Hyatt Toronto is worth the money. This Park Hyatt is located in the Yorkville district of Toronto. It’s about a mile from downtown proper, although there is a lot of high-end shopping, museums, and other offerings immediately around the hotel. Yorkville is a really chic area, and we were really pleased with the location despite our initial disappointment that it was just outside the downtown district. It turned out that this area of Toronto was just as “happenin’,” and thanks to the Park Hyatt Toronto’s location, it provided excellent views of the city that a hotel downtown couldn’t have offered. So that’s one potential concern you might have that we ended up finding not-so-concerning. Although we did not have a chance to take advantage of it, the full-service Stillwater Spa and Salon in the hotel is very highly regarded. Additional amenities offered by the Park Hyatt Toronto include high speed internet, bicycles, and car service. In terms of dining, there’s the chic Annona, which is an intimate restaurant serving Italian dishes and wine. There’s also The Roof Lounge at Park Hyatt Yorkville, which is a great spot to unwind with inventive cocktails and appetizers with a great view of the skyline. As is the case with Park Hyatt Hotels, this luxury comes at a cost. We paid about $275/night USD for our stay at the Park Hyatt Toronto, with parking costing about another $40/night. This is pretty much in line with other Park Hyatts (if not on the low side) at which we’ve stayed. The cost of parking seemed a tad high. Obviously, Toronto is a major city, but this was not a downtown hotel. I can’t say for certain that it was overpriced, but given that we typically pay around the same in the heart of Chicago, I think it was. The main lobby was nice, with an elegant design, and a lot of depth thanks to the rich woods, carpet, and marble. All of the common areas were similarly nice. The room was a bit of a letdown. To be sure, it was a nice room, but it seemed dull, dated, and worn. Unlike other Park Hyatts that have what I would describe as eye-catching, modern rooms, the style and decor here seemed very conservative. More concerning was that the furniture and carpet seemed worn. The areas of the floor that saw more foot traffic were clear. For a property of this caliber and price point, the carpet and decor should have been replaced years ago. We were much more impressed with the bathroom. The Park Hyatt Toronto touts a marble bathroom, and this bathroom was largely nice. It was also a tad dated, but overall, it was in line with what we expected from a Park Hyatt. The bathroom included Le Labo Bergamote 22 bath products, which were high quality and had a great scent. Neither of us had used these prior to the trip, but we were impressed. One of the main reasons we booked the Park Hyatt Toronto was its views of the skyline. Unfortunately, not all of the rooms have a great skyline view, but my understanding is that most do. 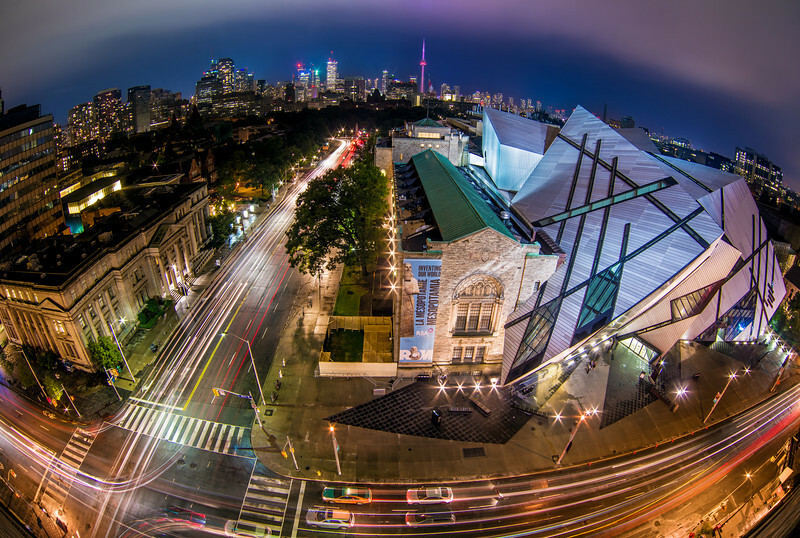 At check-in, I requested a view of the ROM (Royal Ontario Museum), which is directly across the street from the hotel. Fortunately, we were obliged. Check out my photo taken out the window of our room above–this view alone almost made the hotel worth it! We were visiting to celebrate Sarah’s birthday, and the hotel brought us up a complimentary birthday cake for her. This was a nice touch, and reflective of the staff we encountered at the Park Hyatt Toronto. They were generally professional, friendly, and helpful. We’ve stayed at a few Park Hyatt hotels, and I’d have to put Park Hyatt Toronto at the bottom of the pack. Don’t get me wrong, this is still a very nice hotel, but that much is to be expected from a Park Hyatt. While other locations really seem to have a distinct look and design to them alongside their luxury amenities, Park Hyatt Toronto was not all that memorable. Its guest rooms could really use a refurbishment to bring them up to Park Hyatt standards. The location was great and we still really enjoyed our stay, but unlike, say, Park Hyatt Tokyo, I don’t really find myself yearning to go back. When we next visit Toronto, we’ll probably try another hotel for the sake of variety, instead. Despite this, we recommend the Park Hyatt Toronto, just not resoundingly so. Have you stayed at the Park Hyatt Toronto? What did you think of it? Stayed at another hotel in Toronto that you’d recommend? Please share your questions and thoughts in the comments!